Objective To study the injury characteristics in professional football and to follow the variation of injury incidence during a match, during a season and over consecutive seasons. Design Prospective cohort study where teams were followed for seven consecutive seasons. Team medical staff recorded individual player exposure and time-loss injuries from 2001 to 2008. Setting European professional men's football. Participants The first team squads of 23 teams selected by the Union of European Football Associations as belonging to the 50 best European teams. Main outcome measurement Injury incidence. Results 4483 injuries occurred during 566 000 h of exposure, giving an injury incidence of 8.0 injuries/1000 h. The injury incidence during matches was higher than in training (27.5 vs 4.1, p<0.0001). A player sustained on average 2.0 injuries per season, and a team with typically 25 players can thus expect about 50 injuries each season. The single most common injury subtype was thigh strain, representing 17% of all injuries. Re-injuries constituted 12% of all injuries, and they caused longer absences than non re-injuries (24 vs 18 days, p<0.0001). The incidence of match injuries showed an increasing injury tendency over time in both the first and second halves (p<0.0001). Traumatic injuries and hamstring strains were more frequent during the competitive season, while overuse injuries were common during the preseason. Training and match injury incidences were stable over the period with no significant differences between seasons. Conclusions The training and match injury incidences were stable over seven seasons. The risk of injury increased with time in each half of matches. Studies that describe injury risk and injury patterns in senior men's football are typically conducted over one season2,–,12 or during tournaments,13,–,15 and some include only part of a season.16 17 Only few published studies have included data from two or more seasons,18,–,21 and thus, little is known about the natural variations between seasons. The aims of this study were to investigate the injury characteristics in professional men's football teams and to describe the variations of injury incidence during a match, during a season and over seven consecutive seasons. A prospective cohort study of European professional men's football was carried out during the years 2001–2008. The study covered seven consecutive seasons (July to May). In 2000, 14 of the top European men's clubs (clubs that had participated at the highest level in Europe over the last decade) were selected by UEFA and invited to take part in the study. Eleven teams agreed to participate and delivered complete data for the 2001/02 season.11 Over subsequent seasons, 12 more teams were selected by UEFA and included in the study, the inclusion criteria being that they delivered complete material over full seasons (table 1). Seven teams participated through all seven seasons. The full methodology is reported elsewhere.1 All contracted players in the first teams were invited to participate in the study. The study design followed the consensus on definitions and data collection procedures in studies of football injuries outlined by International Federation of Association Football (FIFA)22 and UEFA.1 Baseline data were collected once yearly, at the start of the season. Individual player exposure in training and matches was registered by the clubs on a standard exposure form. This included the first and second team, as well as national team exposure for all players, and was returned on a monthly basis. The team medical staffs were responsible for recording each injury immediately after the event on a standard injury form, and these were sent to the study group each month together with the exposure forms. The injury form provided information on the date of injury, scheduled activity, type and location of injury, re-injury, foul play and, from 2006/7, also the match minute when the injury occurred. The definitions applied in the study are shown in box 1. All injuries resulting in a player being unable to fully participate in training or match play (ie, time-loss injuries) were recorded, and the player was considered injured until the team medical staff allowed full participation in training and availability for match selection. Injuries were categorised under four degrees of severity based on the number of days' absence. All injuries were followed until the final day of rehabilitation. Analysis of variance was used for group comparisons of continuous normally distributed data. The variation of injuries during matches was analysed for two seasons (seasons 2006/07 and 2007/08). The χ2 test was used for comparison of proportions between groups and for pairwise comparisons. Yates' correction for continuity and the Bonferroni correction were used for multiple pairwise comparisons. Injury incidence was calculated as the number of injuries per 1000 player hours. The significance level was set at p<0.05. The study design underwent an ethical review and was approved by the UEFA Football Development Division and the UEFA Medical Committee. There were, on average, 25 players per team (range 15–36). The exposure details are shown in table 2. In total, 566 000 h of exposure (475 000 of training and 91 000 of match play) were registered over the seven seasons. The average (mean) player participated in 34 matches and had 162 training sessions each season (median values being 35 and 173). The mean overall exposure to football during the full season was 254 h with 213 training hours and 41 match hours (median values being 269, 222 and 40). In total, 4483 injuries were registered, with 2546 (57%) occurring during matches and 1937 (43%) during training. On average, a player sustained 2.0 injuries per season, resulting in 50 injuries per season in a team of 25. The types and locations of injuries are shown in table 3. Eighty-seven per cent of the injuries affected the lower extremities. Muscle strain, ligament sprain and contusion were the most common injury types. The thigh, knee, ankle and hip/groin were the most common injury locations. The single most common injury subtype was thigh strain, representing 17% (n=743) of all injuries, with posterior thigh strains (hamstrings, n=525, 12%) more common than anterior ones (quadriceps, n=218, 5%). A team of 25 can thus expect about 10 thigh muscle strains each season, 7 of them affecting the hamstring muscles and 3 the quadriceps. Other common injury subtypes were adductor pain/strain (n=399, 9%), ankle sprain (n=318, 7%) and medial collateral ligament (MCL) injuries (n=220, 5%). Injuries resulting from trauma represented 81% in matches and 59% in training. Overuse injuries represented 28% of all injuries. Severe injuries (causing absence of >28 days) accounted for 16% of all injuries. The most common subtypes of severe injuries were hamstring strains (n=83, 12%), MCL injuries (n=63, 9%), quadriceps strains (n=48, 7%) and adductor pain/strain (n=42, 6%). The average (mean) team at this level can expect eight severe injuries per season. On average, each player missed 37 days due to injury each season. This means that approximately 12% of the season is lost due to injury if we assume that a season lasts 300 days. Twenty-one per cent (n=538) of the match injuries were due to foul play according to the referee, with the majority being due to foul play by an opponent (n=520). The most common foul play injuries were ankle sprains (15%), knee sprains (9%) and thigh contusions (10%). In the two seasons where the match minute of injury was registered (2006/07 and 2007/08), foul play injuries were evenly distributed among the two halves (74 vs 84, p=0.47). Re-injuries constituted 12% of all injuries, and they caused significantly longer absences than non re-injuries (24 vs 18 days, p<0.0001). The incidence of traumatic match injuries showed an increasing tendency over time in both the first and second halves (p<0.0001; fig 1). A similar trend (increasing over time in each half) was observed for contusions (p<0.0001), ligament sprains (p=0.011) and muscle strains (p=0.005). Distribution of traumatic injuries during a match (data from the 2006/07 and 2007/08 seasons). Figure 2 shows the distribution of traumatic and overuse injuries over the season. Traumatic injuries were more common during the competitive season (September to May), while overuse injuries peaked during the preseason preparation period in July. Distribution of traumatic and overuse injuries over the football season. Figure 3 shows the variations in the most common match play injuries during the season. The risk of sustaining a hamstring strain was substantially higher during the competitive season, while the risk of sustaining a quadriceps strain, ankle sprain or MCL sprain of the knee remained fairly equal. Distribution of the most common match play injuries over the football season. The mean total injury incidence for all teams during all seasons was 8.0±3.4/1000 h. The injury incidence during matches was significantly higher than during training (27.5±10.8/1000 h vs 4.1±2.0/1000 h, p<0.0001). The total injury incidence, as well as the training and match injury incidences, were stable over the period with no significant differences between seasons (fig 4). Incidence of injury per season across the seven-season study period (injuries/1000 h). 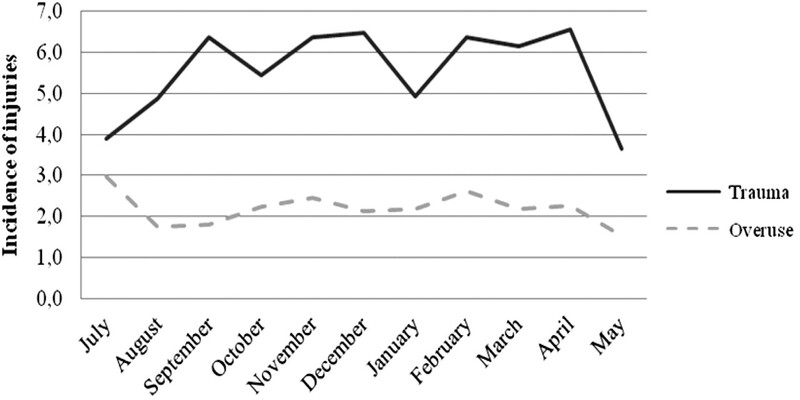 The incidence of severe injuries and muscle injuries did not differ significantly between seasons (fig 5). The risk of ligament sprains decreased between seasons 2001/02 and 2003/04 (p<0.05), remaining stable during subsequent seasons. Injury pattern across the seven-season study period (injuries/1000 h). The principal finding in this study was that the injury risk in this group of professional teams has not changed over a 7-year period. Continuous data over several seasons are needed not only to observe the development of specific trends over time but also to screen for areas of concern and form injury prevention hypotheses. The injury incidences in training and match play in our study are consistent with recent data from the Swedish Premier League,9 11 21 as well as in England and in Norway.20 23 An elite team with 25 players in the squad can expect about 50 injuries each season, half of them minor and causing absences of less than a week, but as many as eight or nine severe and causing absences of >4 weeks. Hamstring strain was the most common diagnosis, which is in accordance with findings in other studies carried out at elite level using the consensus study design. A typical 25-player squad can thus expect about seven hamstring strains each season. It can be speculated that the high risk of hamstring strain reflects the high intensity of modern professional football. The preseason period (mainly July) is predominantly devoted to physical training with few matches, which could explain the finding that overuse injuries were more common and traumatic injuries less common than during the rest of the season. The incidence of ankle sprains, MCL injuries and quadriceps strains was fairly constant over the season. The incidence of hamstring strains, however, was low during the preseason period but two or three times higher during the competitive season (September to May), when most high-intensity matches are played. The collection of data followed the international consensus agreements on procedures for epidemiological studies of football injuries recommended by FIFA and UEFA.1 22 In these papers, the strengths and limitations of injury surveillance studies such as this one are thoroughly discussed. Nevertheless, the obvious strength of this study is the plentiful, homogenous material on male professional players in Europe and the fact that the study is based on an injuryrecording system specifically developed to address the issue under review. Another advantage of studies at elite level is that official match data and other exposure data are frequently published on the UEFA website as well as the websites of the clubs. Our exposure data are believed to be accurate since it was regularly verified against official reports found on websites, in newspapers, etc. A limitation of this study, and all prospective cohort studies, is that no causal relationship between findings can be established. However, studies like this are important sources for hypotheses which can be tested in further investigations. ▶ The match injury incidence in professional men's club football is high. ▶ Hamstring strain is the single most common injury type at elite level. 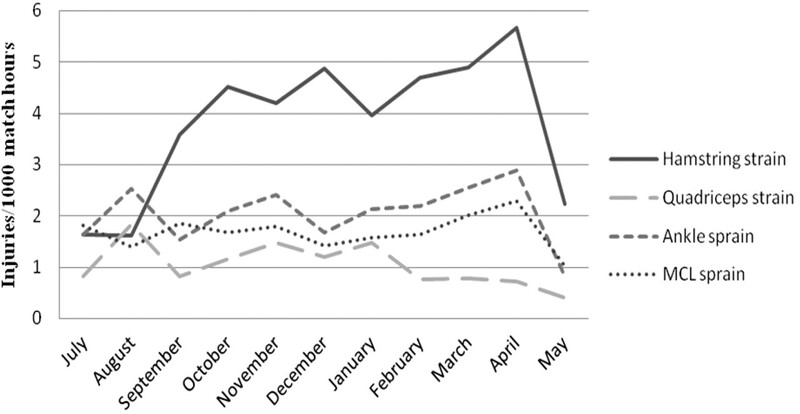 ▶ Injury incidence does not change over consecutive seasons. ▶ Injury risk increases with time in each half of matches. The authors gratefully acknowledge the clubs involved in the study. The help we received from the medical personnel and contact persons is greatly appreciated: Rodolfo Tavana and Bill Tillson (AC Milan), Piet Bon and Edwin Goedhart (AFC Ajax), Leo Groenweghe and Jose Huylebroek (RSC Anderlecht), Joao-Paolo Almeida and Paulo Rebelo (SL Benfica), Egid Kiesouw (BV Borussia Dortmund), Gary Lewin (Arsenal FC), Bryan English and Alex Nieper (Chelsea FC), Dimitri Dobbenie, Jan de Neve and Michel D'Hooghe (ClubBrugge KV), Jordi Ardevol, Lluis Til, Gil Rodas, Ricard Pruna and Ramon Canal (FC Barcelona), Dieter Gudel, Oliver Dierk and Nikolaj Linewitsch (Hamburger SV), Francesco Benazzo, Franco Combi, Giorgio Panico, Cristiano Eirale and Pier-Luigi Parnofiello (FC Internazionale Milano), Fabrizio Tencone and Antonio Giordano (Juventus FC), Mark Waller (Liverpool FC), Roddy McDonald (Newcastle United FC), Mike Stone and Steve McNally (Manchester United FC), Hakim Chalabi (Paris St Germain FC), Nelson Puga (FC Porto), Cees-Rein van den Hoogenband and Luc van Agt (PSV Eindhoven), Ian McGuiness (Rangers FC), Denis Bucher (RC de Lens), Luis Serratosa (Real Madrid CF), Paco Biosca and Viktor Kirilenko (Shakhtar Donetsk) and Pierre Rochcongar (Stade Rennais FC). The statistical advice of Henrik Magnusson (Bsc) is also gratefully acknowledged.
. Video analysis of the mechanisms for ankle injuries in football. Am J Sports Med 2004;32:69S–79S.
. Incidence of soccer injuries and their relation to training and team success. Am J Sports Med 1983;11:63–7.
. Exposure and injury risk in Swedish elite football: a comparison between seasons 1982 and 2001. Scand J Med Sci Sports 2003;13:364–70.
. Football injuries during the World Cup 2002. Am J Sports Med 2004;32:23S–7S.
. Football injuries during European championships 2004–2005. Knee Surg Sports Traumatol Arthrosc 2007;15:1155–62.
. Injury incidence and distribution in elite football – a prospective study of the Danish and the Swedish top divisions. Scand J Med Sci Sports 2005;15:21–8.
. Injuries in male soccer players: team risk analysis. Int J Sports Med 1996;17:229–34.
. Video analysis of injuries and incidents in Norwegian professional football. Br J Sports Med 2004;38:626–31.
. Incidence of injuries in elite French youth soccer players: a 10-season study. Am J Sports Med 2006;34:928–38.
. Mechanisms of head injuries in elite football. Br J Sports Med 2004;38:690–6.
. Soccer injuries. II: Aetiology and prevention. Sports Med 1994;18:81–93.
. Quantifying the functional rehabilitation of injured football players. Br J Sports Med 2006;40:151–7; discussion 151–7.
. Metabolic response and fatigue in soccer. Int J Sports Physiol Perform 2007;2:111–27.
. Technical performance during soccer matches of the Italian Serie A league: effect of fatigue and competitive level. J Sci Med Sport 2009;12:227–33. Funding The study was funded by UEFA. Ethics approval This study was conducted with the approval of the UEFA Medical Committee.